On 4 January 2013 Hungary’s Constitutional Court (CC) struck down the most important provision of the electoral procedural law, after president János Áder sent the bill to the CC for a constitutional review. The government has accepted the court’s decision, so a significantly more media-focused campaign than originally envisioned by the governing party is expected. With the voter registration and the campaign ad limitations Fidesz wanted to focus on its core voters in the campaign via personal mobilization, but the current decision means that much bigger emphasis will be put on the media campaign and undecided voters, who threaten Fidesz’s 2014 victory. Actions by the President and the CC demonstrate that certain checks and balances remain in place in Hungary. 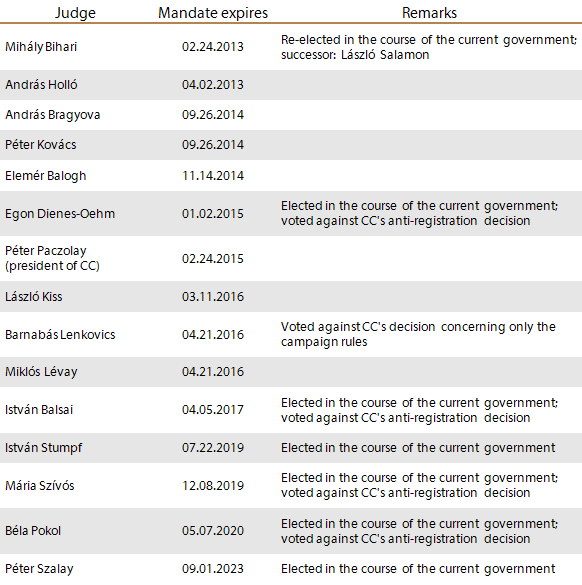 The concept of preliminary registration has been one of the most controversial of the election reform process started in 2010, sowing division even among Fidesz decision-makers. Casting aside all legal and professional objections, the Prime Minister stuck to his position to the last minute, although he backtracked following the CC’s ruling with overwhelming majority. Apparently he came to the conclusion his party could lose significantly more by insisting on cementing the institution ruled patently unconstitutional by the CC into the basic act than it could win by preventing a couple hundred thousand undecided voters from casting their ballots for one of the opposition parties. Moreover, all opinion pollsters show strong public rejection of the registration even within the Fidesz camp.